There’s a small whorl of chaos in the widower Luke’s life that starts to spin from the beginning, when he comes home to find his college-aged daughter Aurea raped and his son Ford locked in the basement. Just before that, his last horse was lost in the woods, possibly eaten by wolves. It doesn’t let up much from there. 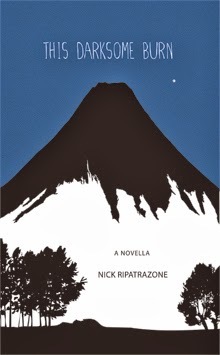 Nick Ripatrazone’s This Darksome Burn is a spare book with barely a memory of a smile. For a lesser writer, that’s all it would be—a dreary, humorless slog. But Ripatrazone is mostly careful in his dramatic choices, delivering them not for their maximum emotional impact, but for their thematic relevance. When characters face conflict the reader is not manipulated into a position of empathy or rage, but is invited to relate that conflict to the other more abstract ideas that Ripatrazone feeds into his prose. The family drama boils on the front burner while broader themes of nature and choice gently simmer on the back. And all throughout is that darksome burn from the title, a tiny stream bending through the woods that has a massive literal and figurative presence in the lives of Luke and his family. The title is taken from the first line of a Gerard Manley Hopkins poem. In it, Hopkins describes the path a minor stream takes as it meanders through a downy landscape before finishing with the plea: “What would the world be, once bereft/ Of wet and of wildness? Let them be left,/ O let them be left, wildness and wet;/ Long live the weeds and the wilderness yet.” It’s a disorienting choice to put this poem alongside this novella, as Hopkins’ nature could only be described as lush and fertile, while Ripatrazone’s wilderness only holds feral pigs and bad history. The “darksome” of this title is more sinister than its source. Ripatrazone is a strong lyric writer, and even within the limits of his extremely brief chapters told from varying character perspectives, he is able to bring out his deeper ideas through relatively small actions and dialogues. Everything is muted, and when there is an action described, it is usually a small one, a minor detail carefully observed. The story doesn’t move through throwdown shouting matches, but with seemingly minor conversations about college credits transferring, and a quick image of the way steam from a soup bowl curls under Aurea’s chin. Ripatrazone is so good at telling more by saying less that when he does go broad, when the conflict is made explicit on the page or a thematic moment is less than understated, it comes off as a shout: This is important! he seems to say. A novel this slim can’t sustain heavy prose without coming off as portentous, especially as it is written in the present tense—the narration sometimes reads as intoned from high rather than simply told. Some passages are so obviously weighted with meaning that they bring the book to a full stop: “[Ford] sits at the table, Butler’s Lives of the Saints open to an entry on Saint Augustine. ‘This is what I want to be.’” Thud. I’d like for Ripatrazone to write a novel longer than the slim 61 pages of This Darksome Burn. He has a talent for realizing the complexities of a family story using atypical means, but this book didn’t have the time to pull out enough of those threads, leaving some of the character’s actions muddled, and its slightly ambiguous ending unearned. If he had more time and room to breathe, I can see him chronicling a larger and more complete family drama while retaining his lyric edge—think Franzen with an editor and a poet’s tongue. Purchase This Darksome Burn HERE.